Frisco Kids: School Snack Foods - What do You Send? It's late January and we've been trying hard to keep the school lunches interesting. I'm not one to pack chips and cookies in my kids' lunches (or rather, they're now packing their own lunches, but I'm still buying the food). I can't promise that our snacks are all super healthy, but I do try to find something of value in the snacks. Hummus and veggies - my daughter is a good vegetable eater now, and will take leftover salad to school. Hooray! She also likes bringing red or yellow pepper strips and individual servings of hummus. I found the individual containers at Costco, though you can probably get them at Trader Joe's and other places too. If your kid is good about bringing containers home, you can always fill one of your own snack size containers from a larger tub. and in spite of what it looks like, it's not an actual whole pea pod you're eating, but ground up and reshaped items. The package is labeled gluten free, and ingredients include rice, vegetable oil, salt and peas (mostly). 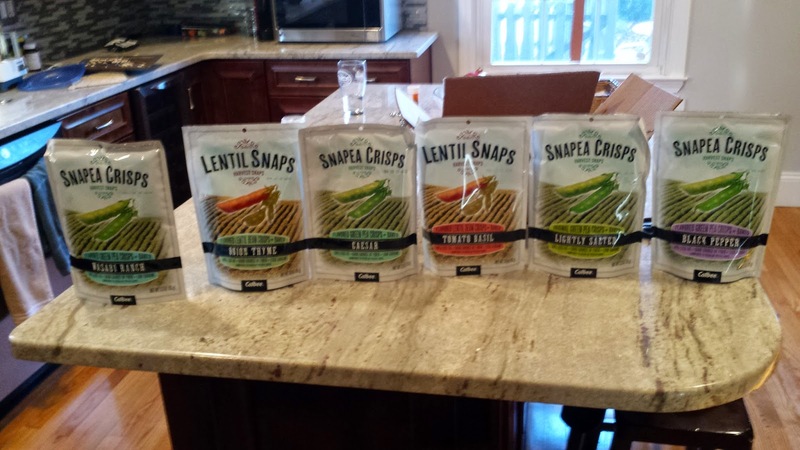 Snapea Crisps sent me some samples of all their flavors to try, including lentils (now I understand how the lentils look like the peas - they're ground up and reshaped too! ), and my kids liked them all except for the spicy wasabi. Popcorn - my son loves popcorn, and eats the microwaveable stuff at home. For school, he'll bring a container of that, or Smartfood cheddar popcorn snack bags. These are by no means low fat or low salt, but there are a few grams of fiber (we're all about the fiber in our house). Fiber bar - as I mentioned, we're all about the fiber. 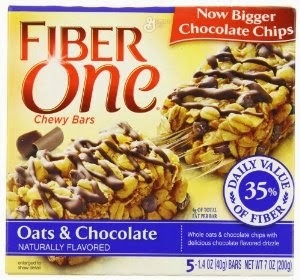 One of my kids needs more of it, so our doctor recommended a Fiber One bar a day - which has 9 grams of fiber. They're super sweet, so the kids like them. We buy these by the truckload at Costco, though the flavors there don't vary, so sometimes I supplement with peanut butter ones (TJ brand) at Trader Joe's - I think they have a similar fiber count. We also get the Fiber One brownies, which are 90 calorie and 5 grams of fiber. They sometimes have these at Costco, and sometimes they carry lemon bars, which are not popular at our house. 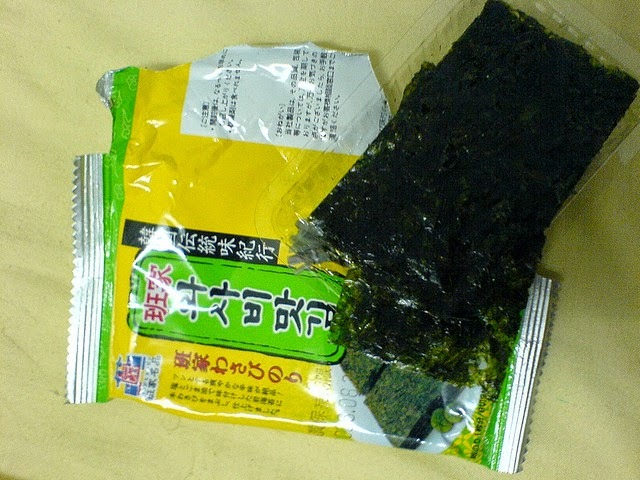 Seaweed - My kids love seaweed, and I get either the small packets (4 small pieces each) from a store like Ranch 99 in Foster City, or larger tubs at Trader Joe's or Costco (though a whole tub feeds several snack mouths). It is low in calories and high in nutrients. 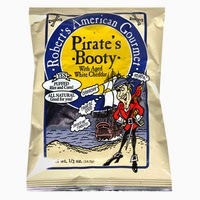 Pirate's Booty - we definitely went through the Pirate's Booty stage when my kids were in preschool. Pirate's Booty gave us a few bags recently, after giving me a tour of their Macy's Thanksgiving Day Parade float (I know, awesome, right?). My kids still like the traditional booty, but not their new Crunchy Treasures. I remember the uproar when my kids were in preschool, and people discovered that Veggie Booty really wasn't a vegetable substitute. Well, duh! It's not a health food, but it is a little better (lower in salt, fat, calories) than chips. 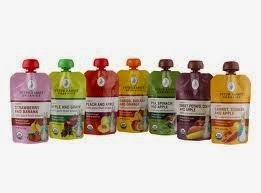 Veggie/Fruit Puree pouches - we haven't tried these, but the folks at Peter Rabbit Organics reached out recently to tell us about their fruit and veggie puree pouches that are all organic, contain 100% fruit and veggies, with no added sugar or artificial ingredients. Each pouch has 70-85 calories, no fat, lots of vitamin C and 1.5-2 grams of fiber (my favorite snack component!). Obviously they're easy to throw in for a snack, and they don't need refrigeration. Peter Rabbit Organics isn't the only company making these type of squeezable pouches, but I like that they're organic and with no added things. What are your favorite snack foods to send to school with the kids?